3-Point Products Oval-8 Finger Splint Size 9 (Pack of 3) by 3-Point Products at Bijc. MPN: P1008-3-09. Hurry! Limited time offer. Offer valid only while supplies last. Light, comfortable finger splints support and protect your fingers to help heal injuries and problems caused by arthritis or other health conditions. Light, comfortable finger splints support and protect your fingers to help heal injuries and problems caused by arthritis or other health conditions. 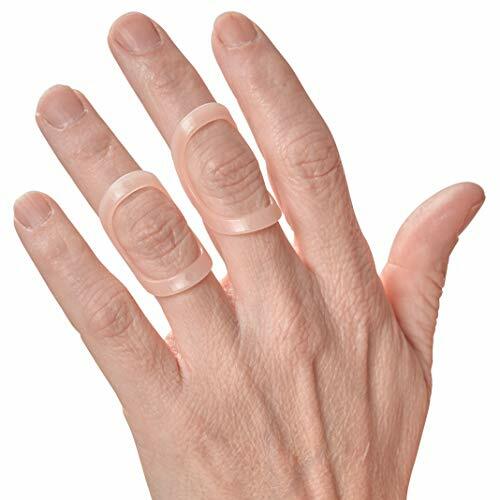 Oval-8 Finger Splints help treat Mallet Finger, Trigger Finger or Thumb, Swan Neck and Boutonniere Injuries, Hypermobility (EDS) and Crooked Fingers. Single size packages are perfect for those who know their size or want the convenience of having more than one splint. A Sizing Set and Graduated Sets of 3 sizes are sold separately for those trying Oval-8 Finger Splints for the first time. SIZING: Choosing the correct Oval-8 size can be affected by swelling, temperature or by how precisely the measurement is made. To choose a size likely to fit your finger, wrap a tailor's measuring tape around the finger joint you are treating. Pull lightly so the tape conforms smoothly around your finger. Use the sizing chart to find the size(s) closest to your measurement. The difference between sizes is very small and you may need more than one size for an accurate fit. You can also measure using a jeweler's ring sizer placed around the joint you're treating or with the Oval-8 Sizing Guide. Oval-8 sizes are precisely calibrated. The difference in circumference from one size to the next is only 1/16" to 1/8" and can be affected by minor swelling or by how the splint is worn. The sizing method described is not guaranteed to be 100% accurate for all fingers. Oval-8 Finger Splints may need to be adjusted by a healthcare provider trained in fitting splints for the most successful treatment. NOTE: Oval-8 Finger Splints are not recommended for children under the age of 4 as they may cause choking if swallowed. Do not use an Oval-8 over an open sore or wound. Wait until any significant swelling has subsided before wearing an Oval-8 Finger Splint. It is recommended that you discuss use of this splint with your health care provider. If you have any questions about this product by 3-Point Products, contact us by completing and submitting the form below. If you are looking for a specif part number, please include it with your message.